Important NSW-based bus industry operators, advocates and bus builders were ignored by the state’s transport ministry leading up to the surprise announcement that double decker buses will return to Sydney’s streets. NSW Transport Minister Gladys Berejiklian announced last Thursday that double decker buses will return to Sydney in a trial of a $650,000 double decker to be operated by Busways on the North West transit way. The double decker will run on routes servicing Blacktown, Castle Hill, Glenwood, Rouse Hill, Riverstone, The Ponds and Schofields. Berejiklian invited mainstream media and a select group of ‘stakeholders’ to the launch on August 23, but missing from the event was the Bus Association of NSW (BusNSW), and the pioneering operator of Sydney’s Bustech double deckers Forest Coach Lines. Forest Coach Lines co-Managing Director David Royle was nonplussed about being excluded from the launch. Royle expressed concern about the transport ministry’s ‘relationship’ with BusNSW, who appear to have been ‘sidelined’ by Minister Berejiklian, where non-inclusion at the double decker launch was the most recent example. BusNSW Executive Director Darryl Mellish says his association had been ‘left out of the loop’. "It was probably a condition set by the Minister’s office," he says. But more concerning still is that Sydney’s two leading bus builders – Volgren and Custom – were also taken by surprise at Berejiklian’s announcement of the Bustech double decker pilot trial with the view to more orders being placed exclusively with the Queensland builder. 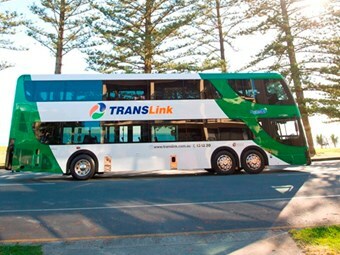 While the first Bustech double decker will be trialled by Busways, further trials will start in early 2013 with Forest Coach Lines and Comfort Delgro Cabcharge on routes between Sydney’s CBD and the north-west and northern beaches. But this appears to mean Bustech will have exclusivity with future orders for Sydney’s double decker buses, believed to be eight new units coming online by 2014. Australian Manufacturing Workers Union NSW secretary Tim Ayres blasted Berejiklian for not proceeding to tender for the new double deckers. Speaking recently on ABC radio in Newcastle, Ayres says it was hard to believe that with ‘fantastic’ bus-building companies in NSW that it was necessary to go to Queensland to get a double decker bus. He says there was no tender process that involved either Volgren’s Tomago facility located just north of Newcastle, or at Custom’s Villawood plant in western Sydney. "They've absolutely got the capability to do the work," Ayres says. "It's a very strange decision and it sent a terrible signal to people who want to invest in manufacturing that the NSW Government's not going to stand up for the local industry." Ayres says the first Volgren or Custom had heard of the double decker bus order was when Berejiklian announced it to mainstream media on August 23. "It's an appalling state of affairs," he says. Ayres and the AMWU have called on the NSW government to review its commitment to the eight proposed Bustech buses. He says if more double deckers are to be built, Berejiklian should ensure there is engagement with bus builders in NSW. Double decker buses last appeared on Sydney’s streets in May 1986, with the last service operating from Wynyard to Taylor's Point. About 1000 double deckers were bought by the NSW Government and operated on the streets of Sydney between 1933 and 1986. The old double deckers were phased out because of reliability issues, difficulty in obtaining spare parts, and a relaxation in the maximum length of single deck buses.